Functional Principal Component Analysis (FPCA) is a generalization of PCA where entire functions act as samples ( over time a interval ) instead of scalar values ( ). The FPCA can be used to find the dominant modes of a set of functions. One of the central ideas is to redefine the scalar product from into a functional equivalent . Using data from SMHI, we are going to look at variations of temperature over the year in Gothenburg. The data spans from 1961 to today and all measurements have been averaged per month and grouped by year. To be able to do an FPCA we need to remove the mean from the data. The first principal component of the data which explains 94% of the total variation is unsurprisingly the variation over seasons followed by the second and third principal components at 1.8% and 0.95% respectively. Looking at the scores for the two first components gives us an idea which years differ the most from each other, i.e., the points which are farthest away from each other. 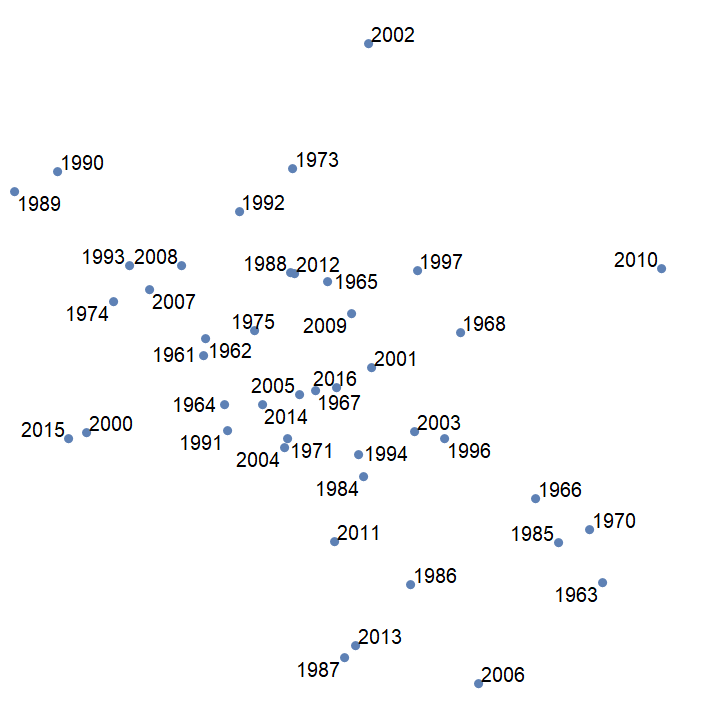 Horizontally, the years 1989 and 2010 seem to be different for the first principal component. Apparently, the winter of 1989 was much warmer than 2010. The years 1971 and 2004 are very close to each other which suggests that they should be very similar, and they are. The second principal component represents a mode where the late winter differs from the autumn/early winter between the years. The year 2006 had a cold early year and a warm late year while 2002 was warm to start with and cold at the end. The FPCA is a powerful tool when analyzing variations in functional data. It applies to multidimensional functional data as well. Functional data analysis, in general, is a powerful tool which also can be used to categorization where different clusters of, e.g., motion trajectories needs to be found.